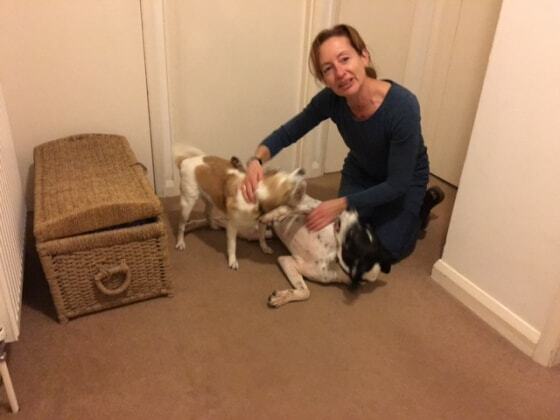 I love dogs, they've always been part of my life - I've grown up and lived with many dogs including labradors, mongrels and terriers and most recently had the pleasure of owning two jack russells for the past 13 years. When we lost our much loved 18 year old terrier Lulu, this left a real gap in our lives and a longing for dog company. I walk my mum’s pointer regularly and enjoy looking after my sister's lovely chocolate lab when she's away. I am a kind, experienced dog walker and use my common sense and experience to ensure we all enjoy a safe and fun walk. I know many great walks in the Brighton area including the racecourse and Stanmer Park (I have an estate car with a dog guard and am able to transport dogs safely in this). I only ever walk a maximum of two dogs at any time so you can rest assured your dog will be well supervised. I also offer dog boarding during daytime and over night in our dog-friendly house with a safe enclosed garden. I am an experienced horse rider and owner - I'm very confident around horses and compete regularly in showjumping and cross country so would consider horse care if needed. My photo gallery show a variety of client’s dogs, family and friend's dogs I walk regularly. I look forward to giving your best friend the love and care they deserve - please contact me to arrange a meet and greet. Shirley expertly handled our boisterous labradoodle puppy! Sending us lovely pics of the walk they had together!